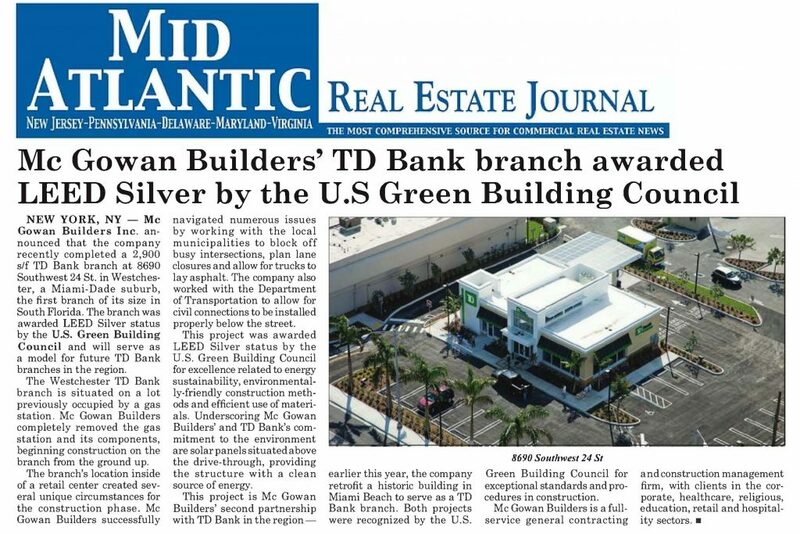 Real estate media coverage of the TD Bank branch completed by Mc Gowan’s South Florida office, which is awarded LEED Silver status by the U. S. Green Building Council for excellence related to energy sustainability, environmentally-friendly construction methods and efficient use of materials. Additionally, solar panels are situated above the drive-through, providing the structure with a clean source of energy, underscoring both Mc Gowan’s and TD Bank’s commitment to the environment. The project is Mc Gowan’s second for TD Bank in the region; previously the firm built a ground-up 2900 square foot TD Bank branch in South Florida which was also awarded with LEED status. Learn more about the details of the TD Bank project in our Projects Library.